When Russia was handed the responsibility to host the 2018 World Cup by FIFA in December 2010, there were many doubters. There was criticism and prolonged internal investigation after the declaration, causing many to doubt Russia’s ability to host the event. On the field, the things were not too bright either. The Russian Football Team was ranked 70 by FIFA before the start of the World Cup, the lowest ranked team among the 32 competing nations. They were drawn in Group A, where Uruguay were destined to be group leaders. Egypt, with the prolific Mohamed Salah, Golden Boot winner in the recently concluded English Premier League, were expected to edge the host nation for the coveted second spot. Many people had written Russia off before the start of the World Cup. Come 14th June, though, Russia gave the perfect start to the greatest spectacle on earth. Saudi Arabia were blown away in a dominating display of football. With the home fans urging them on, Russia pumped 5 past the hapless Saudi Arabia defence, welcoming the other participating nations with a deafening declaration of defiance. Russia was not here to add up the numbers alone. In the next game against Egypt, Russia managed to keep Salah quiet and added 3 more goals to their World Cup collection. The host nation was flying high and expectations were slowly building. The clash against Uruguay though, was a reality check, but Russia had already qualified for the next round before the stuttering defeat. The round of 16 tie against Spain was where Russia matured and made a name for her football in the world stage. Pitted against a talented Spain side, they were down by an Ignashevich own goal as early as the 12th minute. But Russia rallied against one of the best teams of the world to equalize in the 41st minute through a Dzyba penalty. 120 minutes of football could not separate the two sides. Statistically, Spain had 25 attempts to Russia’s 6 and a gigantic 75% ball possession. They had attempted 1137 passes, the most in a football game till date, with 91% passing accuracy, but had failed to score a goal. 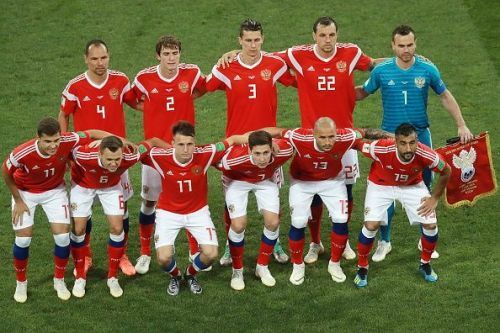 Russia had attempted just 284 passes in contrast, but this Russian side had a desire like no other. They were relentless with their persuasion of the ball. Spending much of the game chasing the ball, they had covered 146 kilometres, Spain with all their flair and passing, had come second here, covering 137 kilometres. Russia would not stop trying, even against the best in the world. They had recovered the ball 43 times, had 16 tackles and 10 blocks and had an astounding 47 clearances, committing 19 fouls and getting 2 yellow cards in the process. When the game moved to penalty shootouts, Igor Akinfeev stepped up. Cometh the hour, cometh the man. Akinfeev made two saves, giving underdogs Russia a memorable victory against the 2010 World Champions and sending the whole nation into wild celebrations. Yet, for all their heroics in the round of 16, Russia were the underdogs again in the Quarter Final game against Croatia. But all through the host nation, hope was gathering strength with every passing minute. So when Cheryshev scored one of the goals of the tournament, the stadium and probably the whole country erupted in joy, only to be brought back to earth by Kramaric in the 39th minute. From then on, it was a hugely entertaining end to end game of football, with Croatia and the rest of the world realizing yet again that Russia were no push overs. In the dying minutes of the first half of extra time, Vida scored and broke Russian hearts, bringing the stadium to a standstill. It became every bit harder for Russia now, but they toiled, with the Russian fans hoping, believing, praying and not giving up. The image of a charged up Stanislav Cherchesov, the Russian Coach, instigating the stadium with his rallying cry would be bright in the memory of football lovers world wide for years to come. The fans around the stadium obliged, their electrifying energy almost transmitting through the live telecast and taking over the world. It touched the players, renewed their vigour and instilled fresh grit and determination into their hearts – they could not give up now. And then it was just a matter of time. Fernandes equalized with 5 minutes left on the clock. Russia had touched the exit door of the world cup and still managed to live to fight in the penalties. What a fantastic football match this was turning out to be. What a fabulous account of themselves Russia had put forth to the world. In the 120 minutes that could not separate the two sides, Croatia had 17 attempts on goal, 62% possession and had played 753 passes. Russia had 13 attempts on goal, but 7 of them were on target, compared to Croatia’s 3. They had played 399 passes, making 19 tackles and 43 clearances. Where Croatia had covered 139 Kilometres, Russia had covered 148 Kilometres! There was so much running in this team, so much desire. In the end though, it was not enough. Akinfeev did make one brilliant save in the penalty shoot outs, but Croatia, quite deservedly, were composed and went through to the Semi-Finals. As Rakitic calmly slotted home the winning penalty, there was an alarming lull in the stadium that is uncharacteristic of a winning goal. Because right then, a stadium and a nation were heartbroken, drenched in tears and sorrow. But amid all that melancholy, there will be an immense sense of pride. Russia had played 5 matches, with 49 attempts on goal and 19 on target. They had scored 11 goals, tied with England. Only Belgium had scored more in this world cup so far. Russia also have the best defensive statistics of the tournament so far, with a total of 259 clearances, tackles and saves. Roman Zobnin at 62 Kilometres has covered the most distance so far. Only Harry Kane (6) has scored more goals than Denis Cheryshev, who is tied with Romelu Lukaku at 4 goals. Russia might have lost the game and exited the world cup, but they had conquered a million hearts and proved their doubters wrong. They had entertained and had earned their right to be among the Quarter-Finalists. On the pitch, Russia were more than themselves, a better version of themselves. This loss will be etched forever in their memories because even in defeat, they had earned the right to hold their heads high. With the World Cup baking up to a perfect end ahead, Russia do not have the time to lament and despair. They have to gulp down this defeat in a hurry, gather themselves up and embrace the world, albeit with a heavy heart, as the we gear up for the Semi Finals. They have to be as charming and welcoming as before. With what they have shown of themselves, both on and off the pitch, Russia has the heart and the soul to do so.